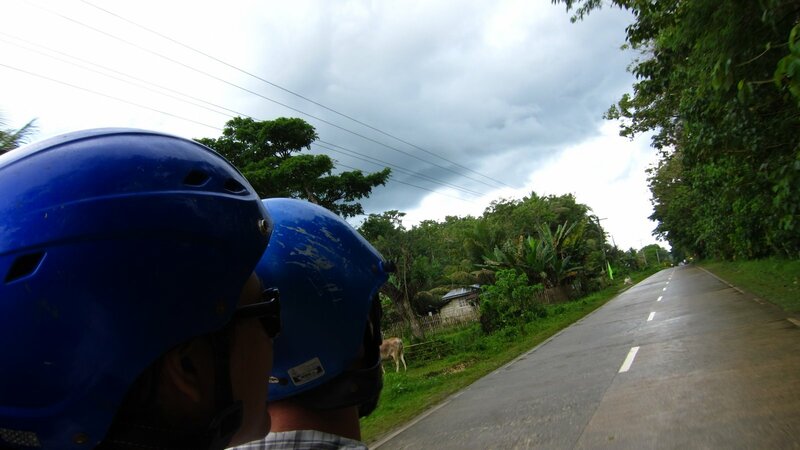 Our last stop in The Philippines was Panglao, an island off the coast of the island of Bohol. We stayed at the famed Alona Beach, which is small so-so beach near some of the most amazing coral reefs in the world. Everyone comes for the diving and we were no different. This was the first time I dove since getting my PADI certification in Thailand last month. Going down to start the dive, doing weightless somersaults, watching fish upside-down, listening to the steady slurp of my breathing and watching the fishies so close they almost touch my mask is both amazing and nerve racking for me, but I love it. We did five dives in Panglao. On our second day of diving we saw 9 turtles (9! ), lion, scorpion, parrot, puffer, and clown fish (think Nemo). We rented an underwater camera, so we could give you a taste of what we were seeing. We were so pleased with the results we’re thinking of changing careers! Check out our pics below. On our way back to the mainland by boat after the dive, we spotted a super-pod of dolphins. About 30+ of them. They seemed to be as interested in us as we were in them. And as Josh and I laid on the front of the boat with our arms stretched down to touch the water, the dolphins swam and jumped around us. Bliss. Well, Balicasag, the dive site off of Panglao (for those of you keeping track that’s an island off an island off an island) that we dove four times because we loved it so much, was very good to us. 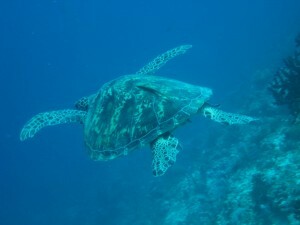 On day three of diving, which was even better than the previous days, we saw more coral, more fish and 12 turtles. We were on our way back to the shore when the dive crew spotted a whale shark. We hastily slapped on our masks and fins and on the word of the crew, jumped into very deep water to get a glimpse. After a brief open-ocean swimming contest that the whale shark was winning, we got more than a glimpse as the whale shark came and hung out by our boat for 10 minutes. It was a baby one and was still three times the size of Josh who stared right into it’s mouth. The crew was thrilled to see it as they’re somewhat rare in Bohol. And we were so elated that my cheeks hurt from smiling the rest of the day. We informed most of people we saw on our way back to the hotel that we saw and swam with a whale shark. I imagine when this adventure is over it will still be a trip highlight. NOTE: All pics in the slideshow were taken by us at one of the Baliasag dive sites. However, the whale shark picture is not ours. We were much too busy just trying to rush and grab the experience to think about a camera, but we wanted to show you a whale shark and it’s scale, so we borrowed this one taken by Ken Knezick that was also taken in the Philippines. WOW!! I loved the experience! Felt like I was tagging along with you. THANKS! I love your posts. But wait a sec- is a whale shark just a name or is an actual mix between a whale and shark? Now that is what I really want to know. And you just lived my magical fantasy, I want to swim among the dolphins. Glad you both are having fun. Sounds like an amazing adventure. Haha. It is just a name… It’s a whale the size of a shark. But technically, it’s not a whale or a shark, it’s a very big fish. Those where amazing pictures,what a great experience for you both(not me I would be scared). Loved the photos! Did you manage to swim with the shark? Really impressed ….such an adventure! We did see a whale shark. It was spectacular. Whale sharks are on most divers bucket lists…absolutely awesome you got to scratch it off. Next up – Hammerheads! I too was disappointed in Donsol so I wouldn’t really trust those statistics they gave abou the whalesharks. I think, honestly, they’re fed up with the humans diving in and swimming after them in the Donsol bay. In one encounter we had up to 12 boats (x 5 – 6 “tourists” each) or over 60 people (including the guides) diving into the waters going after the whale. It was not a pretty sight, for anyone.